Jean François Millet was born on October 4, 1814 in the farming village of Duchy located in Gréville-Hague, now part of Normandy in France. He was often categorized as a Realist painter and was noted for his paintings depicting peasant farmers. He was also one of the Barbizon school founders. The Barbizon school of painters formed from a 19th century group of artists that veered away from Romanticism and toward Realism. Their style was renowned for the softness of form, loose brushwork, color and tonal qualities. 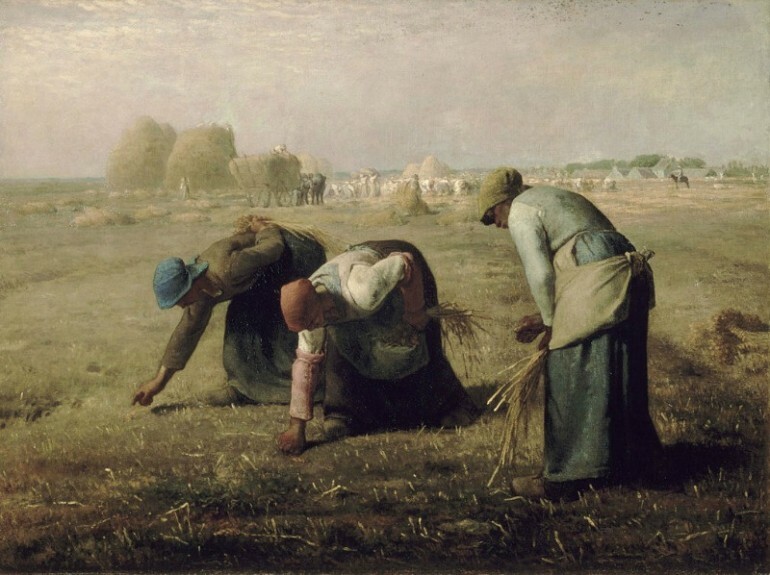 Millet would extend the style from landscape painting to figure painting, which could be seen in his canvases of farmers working in the fields, such as “The Gleaners,” “The Sower,” “The Angelus” and “The Potato Harvest.” Barbizon is an area located quite close to the Forest of Fontainebleau, once the site of royal hunting parties, which became a favorite haunt of Realists and later the Impressionist painters. His first submission to the Salon, done while he was still a student at the École des Beaux-Arts was rejected. In 1840, he submitted a portrait, which was accepted. He returned to his hometown and started to make portrait painting his career. Between 1841 and 1845 he painted small genre pieces and portraits and continued to work on canvases to submit to the Salon, most of which were rejected. When he moved to Paris in 1840, he met and became friends with Charles Jacque, Narcisse Diaz and Constant Troyon as well as Théodore Rousseau, who would later form the Barbizon school together with Millet. Honoré Daumier, who was renowned for this figure draftsmanship, influenced Millet in his paintings of peasants. Millet formed lifelong friendships with his new friends, which also included a government bureaucrat, Alfred Sensier, who would later write Jean-François Millet’s biography. For the next three years Millet got busy working on another important painting, “Harvesters Resting” (Ruth and Boaz). It was thought to rival the works of his idols, Nicolas Poussin and Michelangelo. The 67 x 119 cm oil painting showcased contemporary social conditions rather than symbolic imagery of the lives of French peasants. It was the only painting the Millet dated and the only work that received official recognition as he was awarded by the Salon with a second-class medal for this work. While walking in the fields in Barbizon, Millet created “The Gleaners” in 1857. It was one of the most popular among his works, showing how the poor peasant women and children toiled to gather the left-over grains in the fields after a regular harvest. But this painting did not get favorable acceptance from the Salon and the public. “The Angelus” that was painted from 1857 to 1859 was commissioned by American art collector Thomas Gold Appleton. 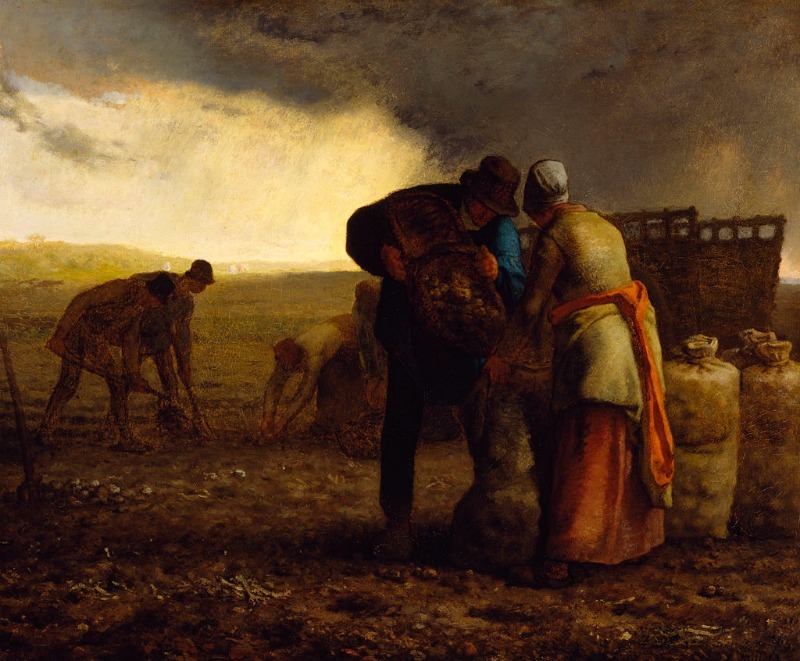 It was initially titled “Prayer for the Potato Crop.” Appleton failed to honor the commission and the painting was displayed to the public in 1865. Millet sold it for an equivalent of $100 and it changed ownership afterwards. After Millet’s death, France and the United States had a bidding war over the painting, which took years to finally end, with 800,000 gold francs as the final price. The disparity between Millet’s economic status and the value of the painting led to the establishment of the droit de suite that gave the artists or their heirs the right to receive compensation for the resale of the artists’ works. Millet was influential to several artists, including Vincent van Gogh, Claude Monet and Georges Seurat. He remained close to his fellow Barbizon school founder Théodore Rousseau and other artists such as Camille Corot, who financially provided for Millet’s widow after his death.